SSP America, a division of SSP Group, a leading operator of food and beverage brands in travel locations worldwide, has opened The Manufactory Food Hall at San Francisco International Airport (SFO). The Manufactory is a collaboration between SSP America and four, multi award-winning San Francisco chefs — Chad Robertson and Elisabeth Prueitt of Tartine Bakery, Pim Techamuanvivit of Kin Khao and Gabriela Cámara of Cala. The 3,241 square foot Food Hall is located in SFO’s International Terminal, Boarding Area A.
Tartine Bakery: Chefs Robertson and Prueitt’s Tartine Bakery has been an integral part of San Francisco food culture since its opening in 2002. Sense of place, sourcing high quality products and impeccable execution and mastery allow Tartine to remain a key player in San Francisco’s ever-evolving food scene. From Chef Robertson’s award-winning line of handcrafted bread and Chef Prueitt’s perfect pastries, the James Beard Award winning duo fill their airside outpost with artisanal bounty. Favorites include Croissants, Scones, Seasonal Hand Pies and Smørrebrød, as well as freshly prepared salads and sandwiches. Tacos Cala: Based in Hayes Valley, Chef Gabriela Cámara’s Cala has been praised by local and national media since opening and has become a firm favorite amongst locals. With its fresh-forward Mexican culinary profile, Tacos Cala at SFO brings sophisticated dishes with deep, resonating flavors. This isn’t just a Mexican restaurant—this is a local, chef-led taqueria that brings each plate up an elevated notch to world-class excellence. Highlights include handmade Tacos with Pacific Rockfish, sweet potato and carnitas fillings; Tortas; Quesadillas; Bowls; and, Salads. Kin Khao Thai Eatery: Chef Techamuanvivit’s Kin Khao Thai Eatery in Union Square earned a coveted one Michelin star within two years of opening. Chef Pim takes her guests on a culinary voyage to her native Thailand with authentic, painstakingly prepared curries, noodles, soups, sandwiches and sweets. Ingredients are thoughtfully sourced from local and sustainable suppliers as well as specialist items from her native Thailand. Featured favorites include the Crispy Fried Chicken Sandwich and the deeply flavored Khao Soi Northern-style chicken curry. Other menu items include salads, noodle soups and special, carry-out boxes of fried chicken and fried tofu. 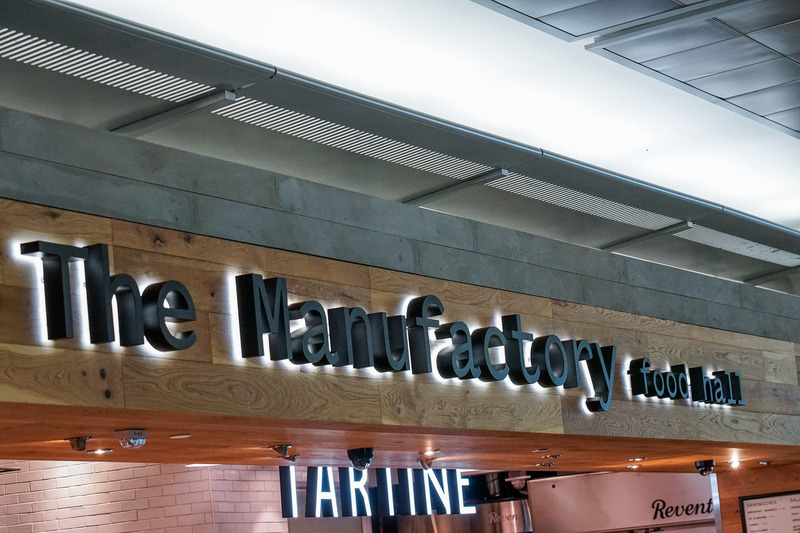 Also included in The Manufactory Food Hall is a full service bar, featuring a cocktail menu created by James Beard nominated mixologist, Julian Cox, as well as a carefully curated list of regional wines, beers and bubbles. The Manufactory’s bar menu also includes small plate options from each of the Food Hall’s individual eateries.